Whatever your business, whether it’s B2B or B2C, email marketing is a cost-effective way of targeting your prospects and connecting with your current and past customers. Why? Virtually everyone uses email on a daily basis. Substance with the right message is important. One valuable email-marketing tool is video (more on that later). You must have an accurate list. Also important is to take steps to maximize your chances to entice recipients to open your email for higher click-through rates. You must also comply with the CAN Spam Act. Whether you’re an entrepreneur with a site or a blogger but don’t have an email list, consider starting now. Bloggers and Web site owners can benefit from the same potpourri of strategies to attract visitors and to persuade them to join an e-mail list. There are at least 13 ways to build a list. Even if you’re 100 percent ethical, you can appear on a blacklist, with will block or weaken your delivery results. If you use Chrome, Chrome Developer Tools will identify and correct any problems in your email coding or HTML. With this email sender, you can get a complimentary 60-day trial without providing your credit card. You can create a campaign with quick, easy design tools. This U.K. provider offers a 14-day free trial. Consider sendforensics for a free email deliverability test. For personal or business use, you can get more than 300,000 free photos and illustrations. This is an easy-to-use code generator for the Gmail Promotions tab. This means coding emails to promote details and promotional codes. This is a tool from Mailchimp that will enable you to create a text-only version to recipients who cannot receive HTML emails. Before you launch your email campaign, this service will analyze your email content and will identify verbiage that will likely activate spam filters. Mailchimp provides a free plan, if you have 2,000 or fewer email recipients and if you send 12,000 or fewer emails during a month. This is a free, easy-to-use, open-source software that will help you to design your emails. Your emails will appear on your recipients’ screens exactly as you intend. Zurb’s service will show you how your subject line, from line and preheader will show in your emails. Return Path’s service alerts of problems by checking your email’s sending IP domain and address, and gives you a grade on your reputation. On a scoring scale, this service helps you to check your subject lines for any possibility of spam issues. It will also explain why there is a problem. To improve download speed, this free tool will reduce the size of images. 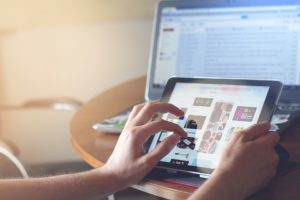 E-mail Marketing Goes Better with Social Media, Study — Small businesses are more successful in an e-mail marketing campaign if they combine it with social media, according to a study.